Bloody has been around in business for around 9 so years, and over this span of time, they have managed to produce extremely efficient gaming accessories which rival top names while still going easy on your wallet. Taking a first look at Bloody AL90, you would instantly be taken aback with the sheer badass-ness the mouse reeks with. 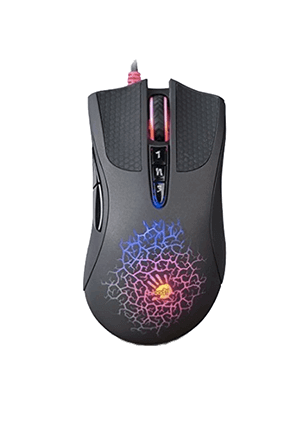 It has a beautiful RGB palette which just suits the overall tough build of the mouse. Like most mice today, Bloody AL90 has nylon bound cables, preventing fraying. 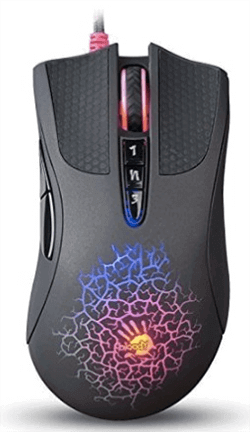 The matte finish quality parried with contoured buttons offers an amazing amount of control on the mouse. Once you have finally had your share of eyeing the aesthetics of the mouse and are ready to get down and dirty and right into your game, you wouldn’t have to wait any longer, with optimized plug and play feature with a very simple software update, you can handle all your macros easily and create color coded profiles which can be changed at any point during your game, helping you to play your game in a way that suits you. The mouse sports a very comfortable palm grip, but you could easily manage it around with a claw grip. The 8 macro buttons are easy to get around and customizable. The body is not only pretty looking, but also sleek and fits right into your hand giving you a very relaxed and pain free experience during your longer gaming sessions. Now getting into the good parts that set this mouse apart from its peers, Bloody has integrated it’s innovating Light Strike Switch which gives an additional 0.2MS of faster response, it may not sound a lot but when you are in the fray, that speck of extra speed and control with the overall handling the mouse offers, you would be on an advantage compared to your competitors. 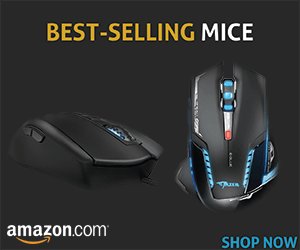 The mouse has weight control on it, if you are the sort of gamer who prefers a heavier mouse with added stability and accuracy you would probably be delighted at how the mouse handles itself, if not you could tune down the weights and have a nimble and extremely responsive mouse. Bloody AL90 packs amazing hardware, armed with the AVAGO A9800 laser sensor that churns out 8200 CPI of adjustable resolution, the mouse tracks movements to the slightest of twitches and variations and quite literally becomes an extension to your arm, also the METAL X’Glide boots offer much more smooth transversal across your mouse pad compared to other gaming mice which usually have boots made of polymers, giving the mouse an excellent control and precision. Bloody has not held back any features, as, it not only has an amazing laser sensor but also the scroll wheel has an infrared sensor that gives it amazing scroll speed and added life. To try the mouse out, I tried out CS:GO and World of Tanks with it. The mouse was an utter beast, I had much better control and accuracy when getting down those headshots due to the overall weight distribution on the mouse and with the contoured buttons and textured grip. I usually play with a palm grip and with my sweaty hands, it is often always an annoyance, but on the AL90 I hardly felt any difference even after 4 hours due to its matte finish body. 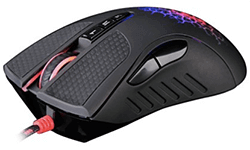 The mouse has enough macro keys, 8 of them as a matter of fact and it is sufficient to say that it would not only cater to FPS and action gamers but to strategic gamers as well, with its versatile CPI and profile creation, it offers a lot to every kind of gamer. The mouse offers features that are worthy of its price range and also features that are not only unique but also unavailable to mice of higher price range, with amazing versatility, control and aesthetics, the Bloody AL90 is a companion to pro gamers and amateurs alike and not only gives an amazing gaming experience but also improves it, making this purchase a sound one. Do you have more to add to this mouse feel free to write it in the comments.